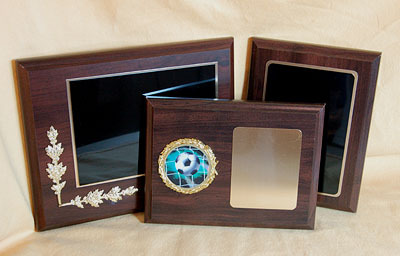 DownEast Engraving, Inc. features the finest quality plaques from America's premier manufacturers. Our in-house engraving capabilities include computer-guided mechanical engraving technology. We also offer our in-house budget plaques in veneer or walnut from prices as low as $9.95! 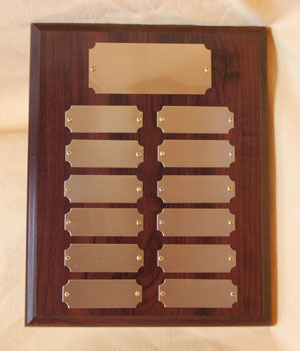 Perpetual plaques are excellent for employee of the month awards or any type of recognition which requires periodic updates. Any plaques will be priced with quantity price breaks. OUR SPECIALTY IS LAST MINUTE AND RUSH ORDERS which usually are available at no additional charge. Contact us for custom designs and ideas for your recognition needs! Quality, accuracy and fast friendly service are our primary goals. We are not perfect, but triple proofreading usually means you will never see our mistakes. We will submit a paper proof for your approval if requested. We have over 15 years experience in the awards and recognition market. If you don't see exactly what you are looking for in the store or on the website, we can probably find it for you in short time. There is no such thing as a "weird" request: We've heard it all! If you need something custom designed, Give DownEast Engraving a call!